UMD is playing for their postseason life, if there is one to even save. Not only have the Bulldogs played themselves out of a secure PWR ranking, but home ice in the first round of the NCHC playoffs is in serious peril too. The Bulldogs will need help to reach postseason goals, but all the help in the world is nothing if they do not win. This weekend will be an indicator if they are totally dead in the water. Picks by @afiskness. 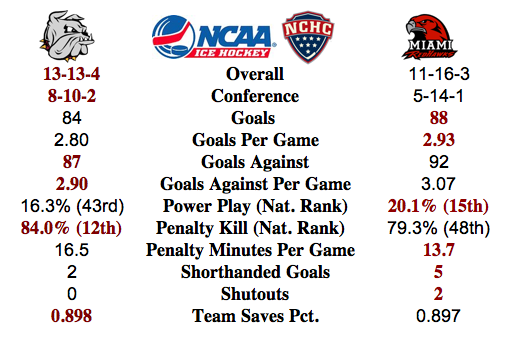 Last weekend the top teams in NCHC were able to spread themselves out from the pack making it look like a two team race for the Julie and Spencer Penrose Memorial Cup. Unfortunately for the Bulldogs, the dreadful second period of play Saturday night probably cemented UMD in the bottom half of the division. Now with a suddenly surging Colorado Tiger team in the rear view mirror, the Bulldogs will need to find some wins or they could end up in seventh place. I could spend a long time writing about the Saturday game, but it won't get us anywhere so I will keep that in the past. Minnesota Duluth @ Miami: The good thing about this series is that the Bulldogs are on the road and that there is a Chipotle in Oxford. The Bulldogs season is currently spirally out of control and maybe the Chipotle will be the difference this weekend. Last weekend the Redhawks were finally able to get a win and may be looking to feast on the wounded psyche of the Bulldogs. Originally I was picking this series as two ties, but I think I am going to go with a split instead. Thanks, Chipotle. Denver @ Miami: Back in December when these two teams last played the Pioneers swept, nut I think this will be a different weekend. The Pioneers seem to be in a funk again and I think the Broncos may actually play good for the prize of home ice. Broncos win and tie. Colorado @ Nebraska Omaha: Scott Owen's Tigers are hot, but this shoud be a balanced series. The Mavericks scoring is much better than the Tigers and they will earn the split.